Christmas time is here, happiness and cheer! The moment that Christmas is near, I begin to want to listen to the Vince Guaraldi soundtrack of 'A Charlie Brown Christmas'. Snoopy has always been close to my heart, because as a child, I could not get enough of this darling cartoon character. I can clearly remember asking mom and dad for Snoopy plushes, clothing and toys while growing up. It wasn't quite Christmas until my brothers and I would sit and watch 'A Charlie Brown Christmas'. 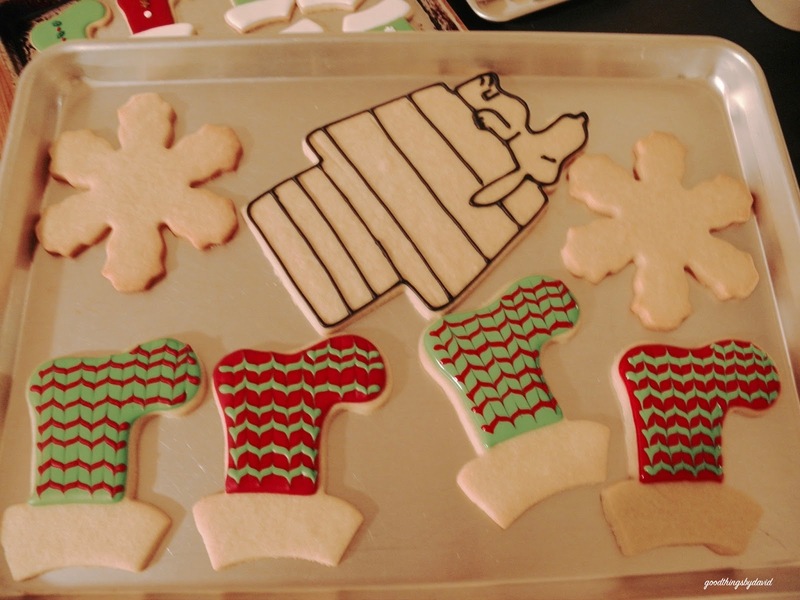 As much as I would like to go back to that wonderful time in my life, I can still recreate some of that magic from yesteryear for my niece and nephews, with some sugar cookies. 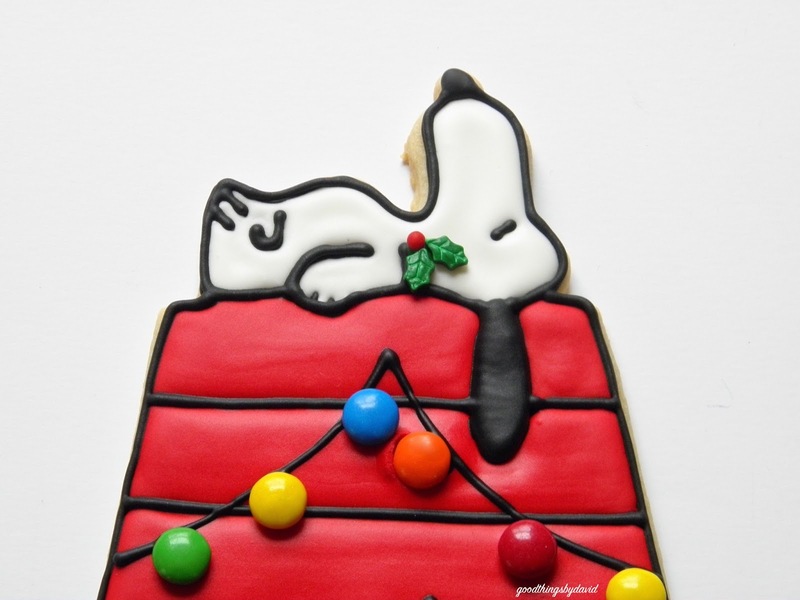 Long ago I fell in love with a certain sugar cookie of Snoopy lying atop his doghouse, decorated for Christmas. I kept that image on my computer and on my phone for quite some time. 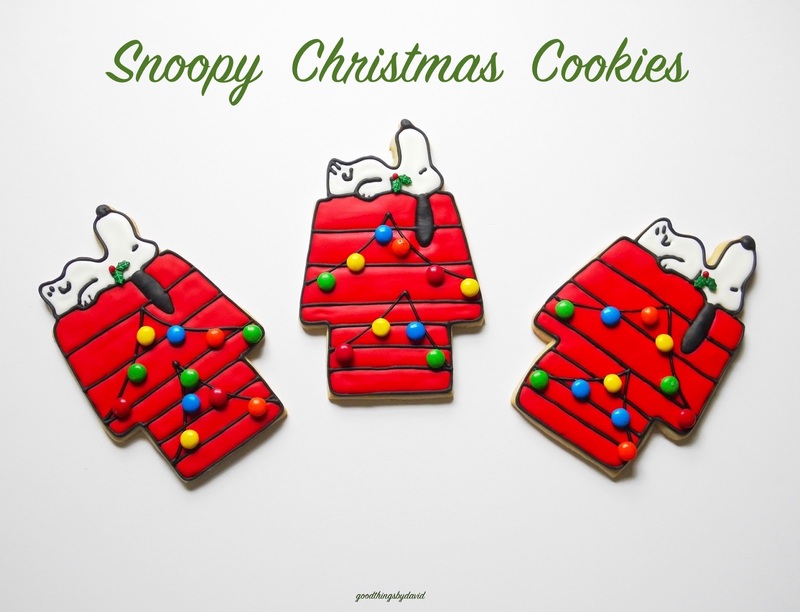 It wasn't until I found a vintage cookie cutter online, that I set about planning some Snoopy Christmas cookies of my own. 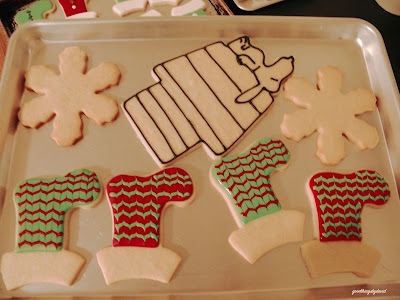 The large Hallmark cookie cutter that you see here was made back in the 1970s (I was a 70s baby!). 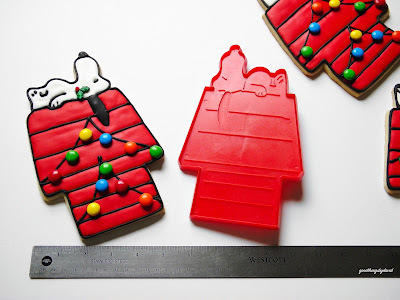 It is big enough to make sugar cookies which can be decorated with a good amount of icing. The only problem with the cutter itself is that it's rather shallow. Because I like to roll out cookie dough to at least 1/4" in thickness, I ended up stamping the cookie dough with the cutter, and cutting the entire shape with a sharp paring knife. After baking and cooling the cookies, I outlined the stamped areas (Snoopy and the doghouse) with black royal icing. You can see just how large these cookies are. Sitting next to those snowflakes and stockings, the 8"-9" Snoopy cookies are perfect for large cellophane bags. Snoopy was flooded in white royal icing, including the ear, and the doghouse was flooded in red royal icing. 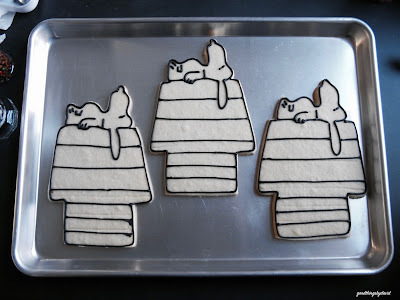 With the same black royal icing and a #2 piping tip, I outlined once again, the doghouse, as well Snoopy. 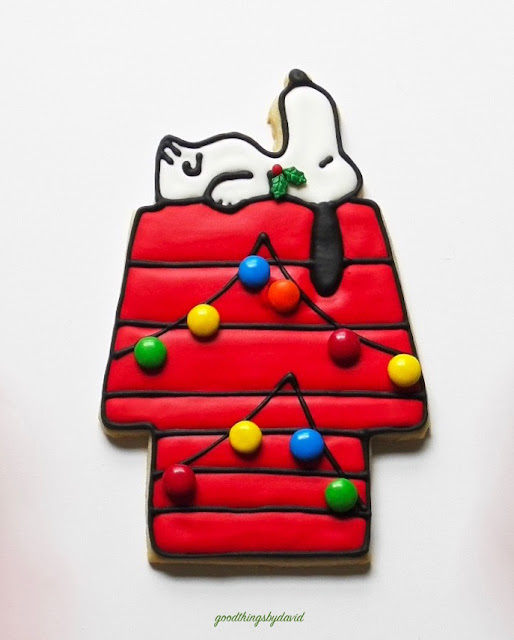 In addition, Snoopy was given a plump black nose and black ears. The entire cookie was left to dry completely. 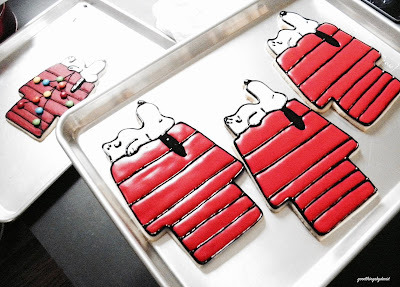 Using some green royal icing, I attached two holly leaf candies and a holly berry to Snoopy's dog collar. It made him look very festive! A swag of black royal icing was piped on the roof and on the wall of the dog house to delineate a string of lights. Dots of black royal icing were piped here an there on the "string of lights", and M&M candies were carefully placed on them. 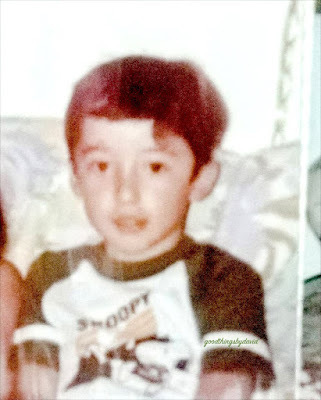 This is me when I was five years old. That green Snoopy t-shirt was a favorite of mine! Some things just don't change. Needless to say, these cookies were a lot of fun to make. A part of me was nostalgic for those great childhood memories, but another part of me was extremely happy that I could share the joy of one of America's most beloved cartoon characters, with my niece and nephews. 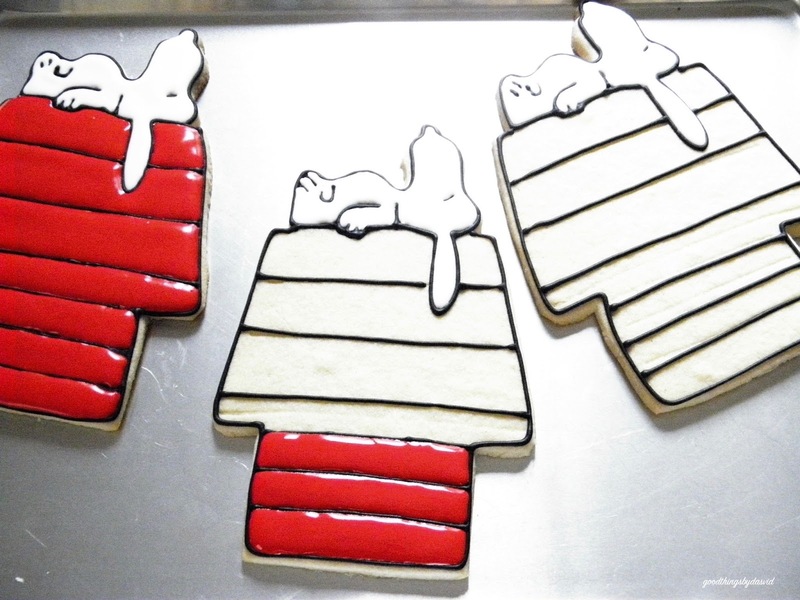 I think the little ones are going to love these Snoopy Christmas cookies. 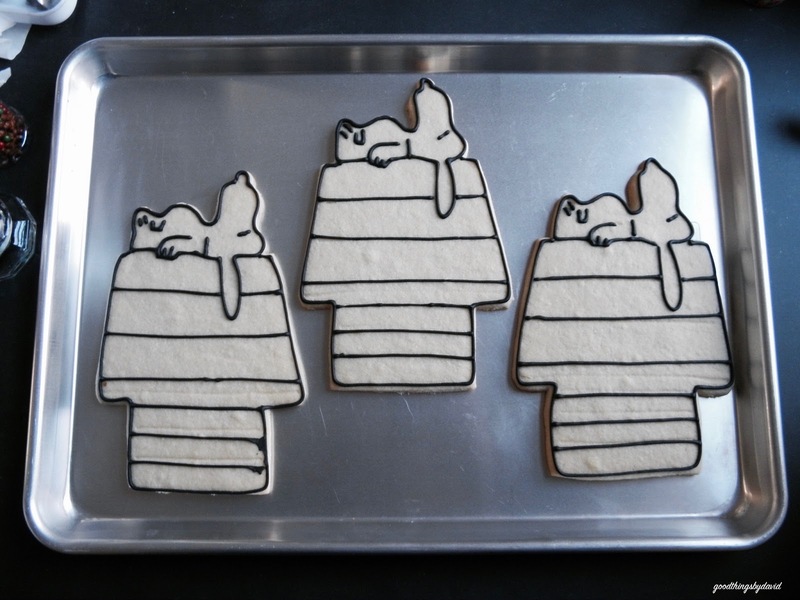 Adorable--both you and the Snoopy cookies. Merry Christmas. Oh my gosh LOVE this cookie cutter!! Lori, it's a nice cutter with a classic, vintage look to it. Look for one online!